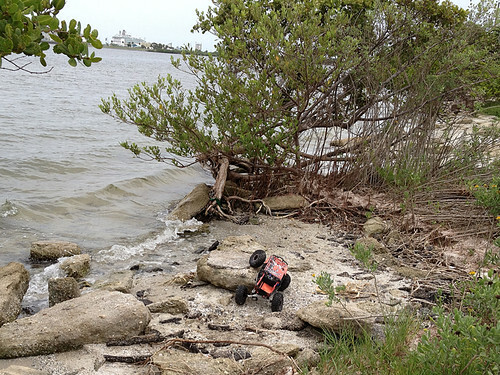 Axial Racing - The Axial Geocache #4-2012 Cache and Carry – Found! Dan found the Geocache on Oct 4th, his birthday, which was quite a long journey for him coming all the way from North Dakota. Way to go Dan!!!!! Here is what he had to say about his adventure. 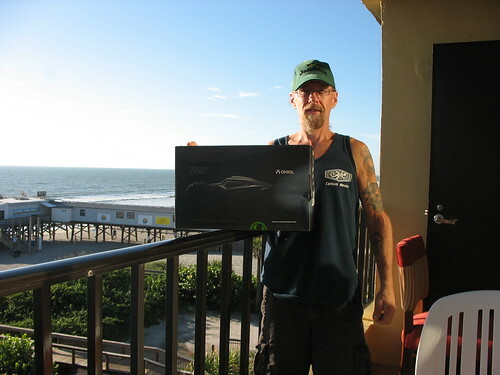 “I want to first say thanks to Axial for a great geocache! 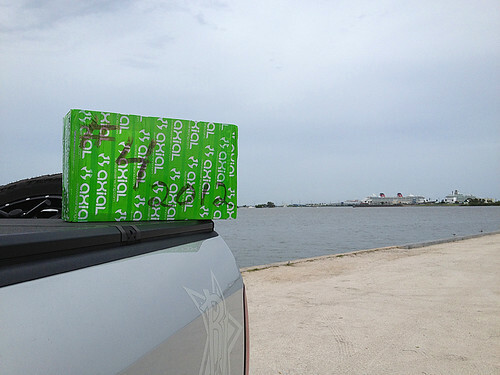 I recently saw your post on facebook that two of Axial’s geocaches were still out there to be found. I couldn’t believe that no one had found them yet! 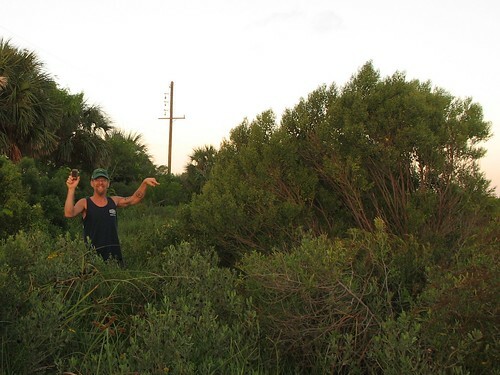 With my birthday coming up on October 4th, my wife and I decided to plan a trip to Cocoa Beach to look for cache #4. 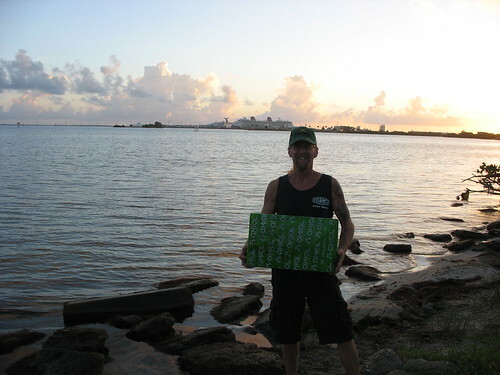 We flew from Minot, North Dakota to Miami (1950 miles) and drove up the coast (206 miles) to the cache spot. When we arrived at the coordinates, it was getting dark and had started to rain so hard that we had to take shelter. The lightening was intense and knocked out all lights in the area, so we decided to wait until the next morning, Oct. 4th (my birthday) to search again for the cache. 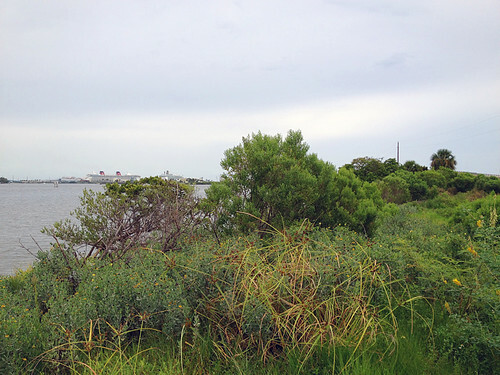 We looked at the pictures on the blog page and were certain we were at the right spot. We got up early the next morning and headed back to the cache spot. After a few minutes of searching, I saw the green box. I could not believe I found it! Upon opening the box I was excited to find an XR10 kit. What an awesome birthday present! I’ve been geocaching for years and have found numerous caches, but this was the best cache “booty” ever. I regret that I was not able to bring my Wraith along for the ride, but will send pics of my crawler at home in North Dakota. My Wraith is pretty much stock except for a couple minor tweaks like Jamie Varner (MMA fighter) driving but I would like to customize it more in the future. 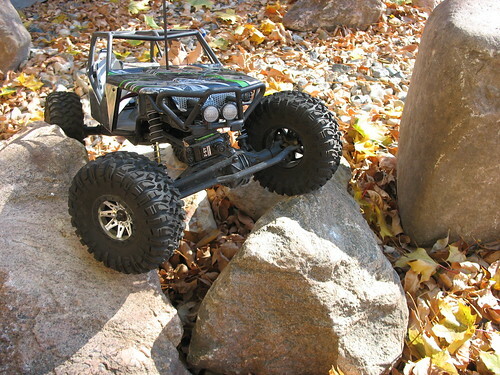 Dan scored a complete Axial XR10 Rock Crawler… well almost complete, and some cool Axial swag only available to the Geocache finders. Dan, we are sending you the missing parts bags so you can assemble the kit. Here it is!!!! The fourth Axial Geocache of 2012!!!! Remember it’s about the adventure you make to get there and get the goods that really makes this program fun. We like to hear from you about your experience in tracking it down. You will not be disappointed at this location when you get there. 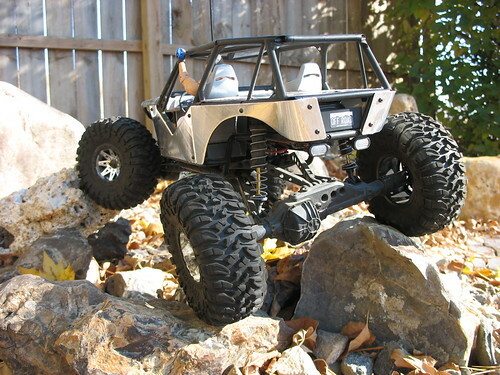 Grab some water and your rigs and head out to do some RC Crawling. This is a cache and carry find, once you find it, it’s yours to take with you. Tread lightly and leave no trace. What would it take to get you guys to do one in Alaska? John, thanks for the suggestion. You never know where the next one will be….. Stay tuned. Found it! Happy Birthday to me. Details to come. We may have a winner!!!! Send in your details. A New York hunt would be great! How about showing Antarctica some love?